Here is a basic list of Retreating Forwards Techniques. 1. Evade – Covered in the last post on Retreating Forwards. 2. Flanking – Step out to your left or right at 90 degrees and then step back into the opponent while leaning in and moving forwards the entire time. The shape will look similar to this < or > . Think of roller skating or ice skating. if you do not lean in a bit then you will fall over your own skate due to your momentum. 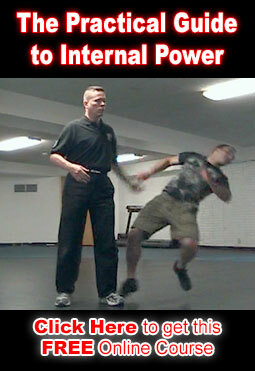 In the case of the physical technique you are in an extremely weak position if you are not leaning in towards your opponent all of the way through the movement. The trick is to step far enough away with the first step so that they can not hit you while you are flanking and to over run their position on the way back in. Your lean into them does not have to be much and in fact can be slight enough so that they can barely see it if they are looking for it. You can flank this way against any straight punch or kick and against a hook if you are moving to the opposite side of the incoming strike. So, if they are throwing a hook from my right side then I am stepping out to my left. 3. Crowding & smothering – I can step directly into the opponent and run them over crowding and or smothering their ability to throw a technique. I will be writing at least one full post dedicated to the topic of smothering. 4. Penetrate through the attacker. When the opponent throws a big hook I simply launch myself (leading and making contact with my forearms) straight through the middle of their arm with my entire body weight. The idea is to make their arm collide into your entire body weight moving forward and through them. If the arm collides with your entire body weight moving forwards and through it then typically the arm will be temporarily paralyzed from the impact with the body momentum and weight. Another option is that if the attack is a big haymaker and I can step in and hit / shove their head in the direction that their fist is coming from it will completely stop the incoming hit.